Every year, nationwide statistics reveal that nursing home abuse continues to be a major problem in society. The National Center on Elder Abuse reports that almost six million cases of elderly abuse occur every year. Over 67 percent of victims of elderly abuse tend to be females. Even more disturbing, the Center reports that over 91 percent of nursing homes do not have adequate staffing to ensure that the needs of elderly people are met. In Virginia, the statistics for nursing homes are just as disheartening. Over 40 percent of Virginia nursing homes were discovered to have serious issues with maintaining a safe environment and food sanitation in 2008. Over 50 percent of nursing homes failed to maintain adequate professional standards that year. Medicare routinely updates their data on the 287 nursing homes rated in Virginia based on identified violations and deficiencies found at the facilities through inspections and investigations. 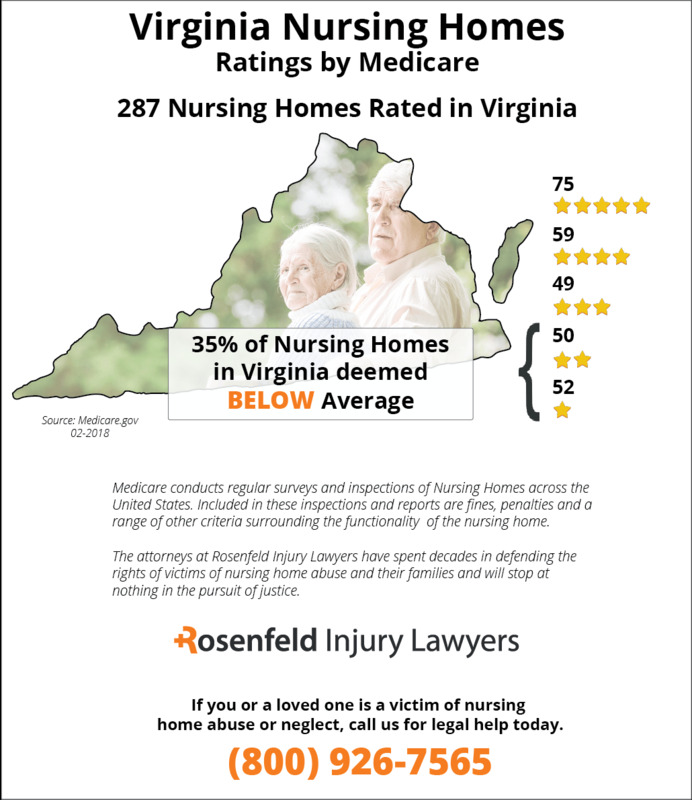 According to the federal agency, currently, 102 (35%) of Virginia nursing homes provide substandard care based on national averages. Was your loved one injured, abused, mistreated, or did they die unexpectedly from neglect while residing at a nursing facility in Virginia? If so, we invite you to contact the Virginia nursing home abuse & neglect attorneys at Nursing Home Law Center today. Let us review your case for financial compensation to ensure your family receives the monetary recovery they deserve. It is important for family members to speak up about suspicions of abuse. Patterns of abuse are usually common in nursing homes that are attempting to prey upon the financial assets of residents. It is important to stop abuse from occurring any more and to remove your loved one from the situation. Speak now to our nursing home lawyers to receive the help that you need to make a difference in the life of a loved one. In Virginia, nursing home abuse and neglect are prohibited under the Adult Protective Services Act. The Adult Protective Services Act also establishes the procedural system for dealing with reports of abuse and neglect in Virginia. It handles complaints that are reported for adults 60 years of age and older, and complaints that involve abuse, neglect and exploitation. APS provides a wide range of services that may be available to remove an elderly person from an abusive situation and end any further mistreatment. Some of the services that may be available include alternative shelter, transportation, nutrition services, legal intervention, adult day care or even foster services. 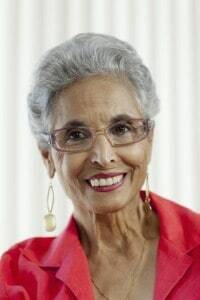 Those who suspect that an elderly person is the victim of abuse can get in touch with a department of social services to file a report of abuse. The department maintains a toll-free hotline that can be accessed at: 888-832-3858. In Virginia, family members only have a limited period of time in which to file a negligence or wrongful death claim. They should be aware that the statute of limitations only runs for a period of two years, and this means that individuals must file a case within this time frame. The statute of limitations begins to run from the date in which an injury is discovered or the death of the individual occurs. Virginia laws maintain a $1.5 million cap on damages for acts that occur after August 1, 1999. Punitive damages are capped at $350,000. There are several departments that can handle reports of abuse or neglect in Virginia. These are the Virginia Department of Health, Adult Protective Services, Department of Health and the Long Term Care Ombudsman. 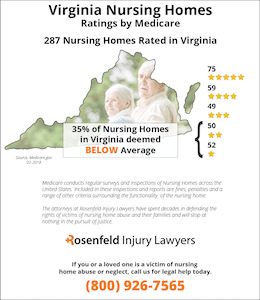 Nursing home negligence attorneys in Virginia can help you file a report of abuse or neglect with any one of these departments. These forms of neglect can be just as harmful on the lives of residents as other forms of physical abuse. It is important for family members to take action when they realize that neglect is occurring in a nursing home. Call our lawyers today to schedule an initial consultation and understand your loved one’s rights. In many situations, placing a loved one in a Virginia nursing home is the last option available for the family. Turning over their care and well-being to a medical team requires an exceptional level of trust in the nurses, nurse’s aides and doctors who will be providing treatment to ensure their health. Many families have a high level of expectation that the nursing facility will do everything they can to maintain the loved one’s quality of life while at the home. Upon admittance to the nursing home, the family never expected to be notified that their loved one has suffered a facility-acquired bedsore. Bedsores (pressure sores; pressure ulcers; decubitus ulcers) are unfortunately a common occurrence for nursing home patients who are limited in their mobility. This often includes wheelchair-bound or bedridden patients, or residents who are incapacitated due to a spinal cord injury, coma or other debilitating condition. A bedsore can develop in as little as a few hours when the patient does not reposition their body to alleviate pressure on specific pressure points. Typically, the patient’s body weight can place significant pressure on skin that continuously touches bedding material, wheelchair cushions and pads. The pressure restricts oxygenated blood circulation, which causes skin damage or tissue death to the affected area in as little as two hours or more. At its beginning stage, pressure sores typically form a blister, red dots or a reddened area. To the touch, the skin will feel firmer are softer than the surrounding area and is often extremely tender. The condition can be stabilized by alleviating the pressure. As long as the pressure remains off the area, it can usually heal completely within a few days. However, without adequate treatment, it can easily develop into a serious life-threatening wound. The medical staff at the nursing facility is obligated to provide every patient the best care they can around-the-clock. This means that all treatments, protocols and procedures must be followed strictly to ensure the health of the patient is optimized. Any failure to provide quality care can result in a variety of conditions including the development of a bedsore. Because of that, the nursing staff, the facility and doctors can all be held accountable for negligence if the patient develops a pressure sore. Without proper treatment and attention, an early-stage bedsore can develop into a severe ulcerated wound, where the underlying tissue, fatty deposits, muscles, tendons and bone are exposed. At this stage, the patient can easily acquire osteomyelitis (bone infection) or sepsis (blood infection), which can place their life at risk. If you feel angry and upset because the nursing staff was negligent in their duties and your loved one has suffered a bedsore, it is crucial to hire a Virginia bed sore lawyer. 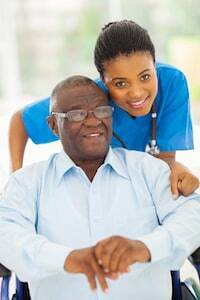 Your nursing home attorney can take quick legal steps to stop the negligence and abuse now. In addition, they can ensure that your loved one receives the best healthcare from trained medical professionals who specialize in treating serious decubitus ulcers. Fill out the contact form here to schedule an appointment with one of the reputable Virginia bed sore lawyer’s below. They can provide you a free no obligation initial consultation. They accept cases on contingency, meaning all of your legal fees will be paid through a jury award or an out-of-court settlement.